Parents Heather and Shawn Lawrence checked in to the Ronald McDonald House as returning residents. They stayed here a few years prior when son, Bo, was born early. On Oct. 22, Heather delivered her daughter, Ava, five weeks early. Unfortunately, she had breathing problems and jaundice. They were glad to return to the House, but also worried while trying to stay hopeful their daughter would recover. “We felt like we were at a second home,” said Shawn Lawrence. Brothers and sisters are always welcome considering the House has a play room and teen lounge offering tons of toys and games like air hockey, basketball throw board games and various other stuffed animals and toys. After Ava grew healthy enough to return home, they checked out on Halloween after staying at the House for five nights. A smooth pregnancy is what all new moms and dads hope will happen. What gets scary is when the pregnancy goes just as it should and then one day, turmoil strikes. Terry and Brittany Murphy had an easy going pregnancy and then 25 weeks in, Brittany was in labor for 12 hours without knowing it. Their daughter, Bralynn, was born early weighing only 1 lb. 10 oz. They were scared, shocked and did not quite know where to turn for rest until they were introduced to the Chattanooga Ronald McDonald House. The next few months felt like a waiting game. Seven weeks in, Bralynn was breathing on her own. After checking in the House and Bralynn seemed to be improving, their outcome was finally looking hopeful. 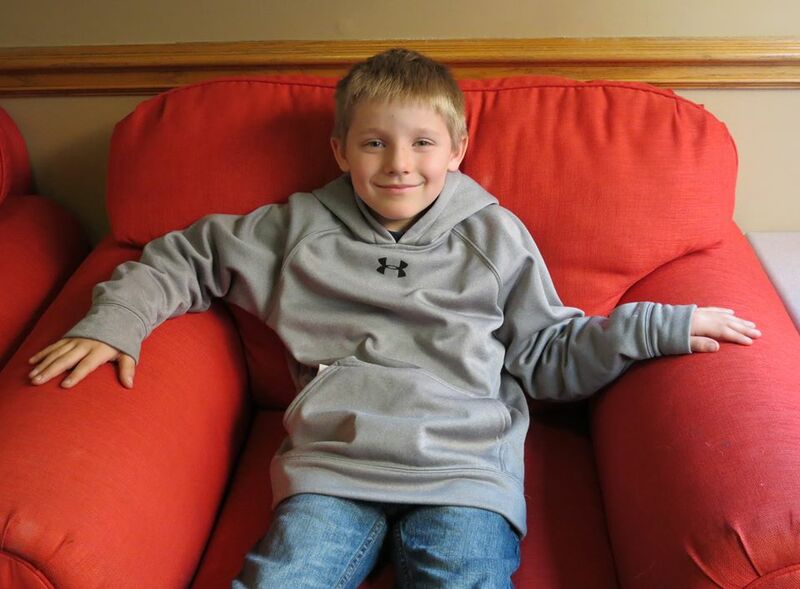 “I don’t know what we would’ve done without the Ronald McDonald House,” Terry said. Now, Bralynn is breathing well, transitioning into bottle feeding and expected to keep progressing. With several unsuccessful pregnancies to leave Kara Massengale and her husband, Brent, heartbroken, it was only natural for them to be fearful when they found out they were pregnant once again. At just 17 weeks pregnant, things didn’t seem hopeful. That didn’t stop them from believing their son, Brooks, would survive. weeks after his birth, he was stable and it was only a matter of time before he grew big enough to be discharged from the hospital. The doctors estimated Brooks’ NICU stay to be two-months-long. With the estimated stay, the thought of driving back and forth from Dayton, Tennessee multiple times a day seemed like another daunting stressor added to the equation. Then, Kara and Brent found hope in the Chattanooga Ronald McDonald House®. “It’s so nice to have a reliable place to stay and an opportunity to meet other families,” Kara said. The Massengales have stayed at the Ronald McDonald House for over 47 nights and found rest, comfort and community in the House with mothers’ and fathers’ also going through difficult times. Laura and her husband, Michael, from Hillsboro, Tennessee recently stayed at the Chattanooga Ronald McDonald House for a second time during May and June. Their beautiful newborn triplets, Benjamin, Thaddeus and Nathanael came into the world eight weeks early. Although, this wasn’t their first stay. The first time they stayed at the House was in August of 2014 when their newborn daughter, Annabelle, had a stroke and uncontrolled seizures. She ended up staying in the intensive care unit and was later well enough to go home that September. Little did Laura and Michael know, they would be back again nearly two years later. When their triplets were born early, they checked in to the House. This time, Annabelle was by her parent’s side and got to stay close to her three new little brothers! “I really liked to interact with other residents. It was an opportunity to be really encouraged,” said Laura. Both stays were an equally good experience for them during their trying times. They will never take the home cooked meals and private bedrooms for granted. After a 20 night stay, a family that was once a family of three went home as a family of six. Randy and Beth Stephens of Cleveland, Tennessee have three children, John, Will and Kate who anticipated meeting their newborn sister Annie on Dec. 21. Between finding out Annie suffered from dandy-walker syndrome, a human brain malformation, and seizures in the hospital which caused Annie to also have hydrocephalus, an excessive accumulation of fluid in the brain, it was uncertain on when Annie’s siblings could meet their newborn sister. On Dec. 28, Randy and Beth found refuge in the Chattanooga Ronald McDonald House. “This place just highlights all the good in the world,” said Randy Stephens. They considered the House to be an “absolute blessing,” as Beth described it. 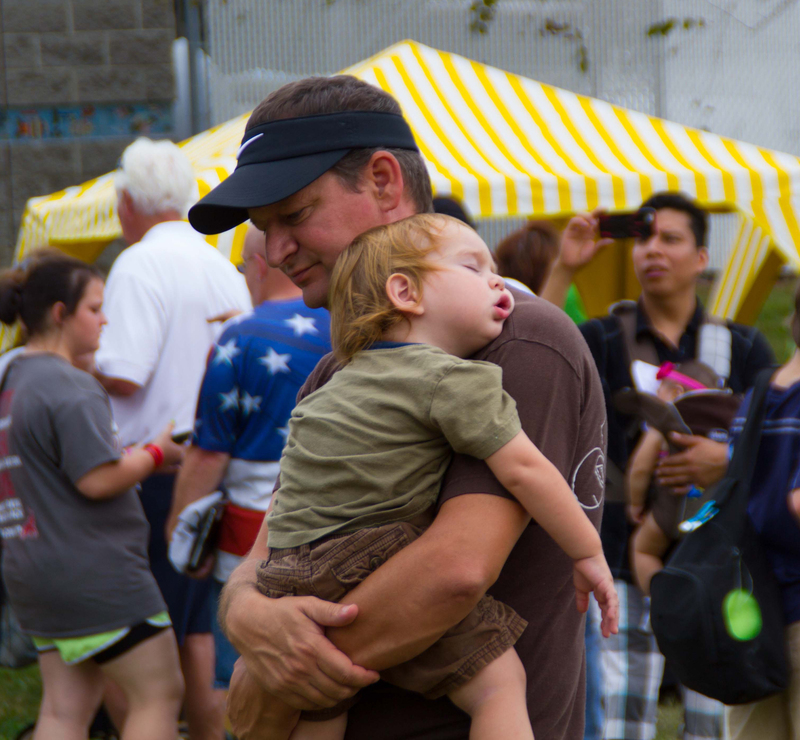 When they found refuge, they started to find hope. On Christmas Eve, Annie had a shunt put in to help with her hydrocephalus. After being separated while their parents tended to their baby sister, John, Will and Kate were finally able to stay with them at the Ronald McDonald House. “My little girl would cry at night because we had to be separated.” Because they were able to stay at the Ronald McDonald House, they could all be together and not miss memories. After days of constant prayer, surgery and care, Annie was discharged from the NICU. Randy and Beth checked out of the Ronald McDonald House on Jan. 18. For 21 days they found rejuvenation in the “House that Love built.” “It made all the difference in the world,” Randy said. …including minutes each activity will keep your child occupied and how much energy they’ll use. Days & times: Oct. 4, 10 a.m. – 6 p.m. & Oct. 5, 1 p.m. – 6 p.m.
* There will be a plethora of activities for cute photo ops to enter your child into for the Photo Contest! Energy used: Not much. Although, better to decorate a pumpkin then your kitchen walls. Minutes: Depends. If he/she is more of a minimalist and only wants a balloon, 8 minutes. If your child is a Michelangelo at heart, it could be 15-20. Energy used: More like energy gained. There’s nothing better than seeing a child’s face light up when they look in the mirror and see the creative art. Minutes: 10 to 15 minute rounds. Energy used: Moderate. Petting animals, feeding, and riding them will cause your child’s heart to melt. Minutes: As long as you please. Energy used: They will most likely make your child fall asleep in the car ride home. Energy used: A good amount if your child is striving to be an archeologist. Energy used: Some. Ronald often gets little magicians from the audience to be his helper! 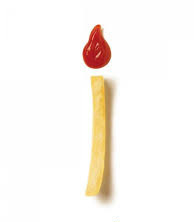 Minutes: This is up to you. Energy used: Moderate. If their eye is on the prize, they’re really going to give it everything they have to win. Mayfield ice cream samples on Saturday and Sunday! We’re so thrilled for you to enjoy the annual Autumn Children’s Festival (ACF) and celebrate 25 years of family fun! We would like to thank our long-standing partnership with the Tennessee Society of CPA’s Chattanooga Chapter who volunteer their time to plan, underwrite, set up, and coordinate all the ACF activities. The Festival wouldn’t be possible without the hundreds of volunteers, gracious donors, sponsors, and all who come to participate in the fun! In lieu of presents for her 9th birthday, Julia asked for donations to Ronald McDonald House Charities of Greater Chattanooga. She raised $540! 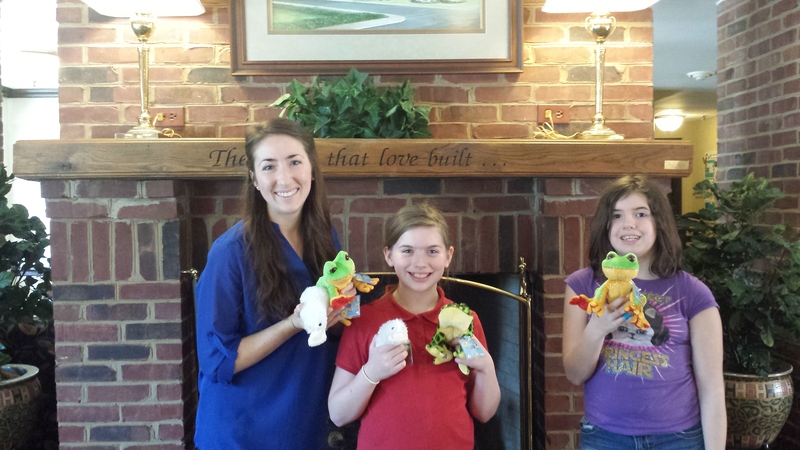 Along with the monetary donation, the Kilgore family also donated WebKinz stuffed animals. 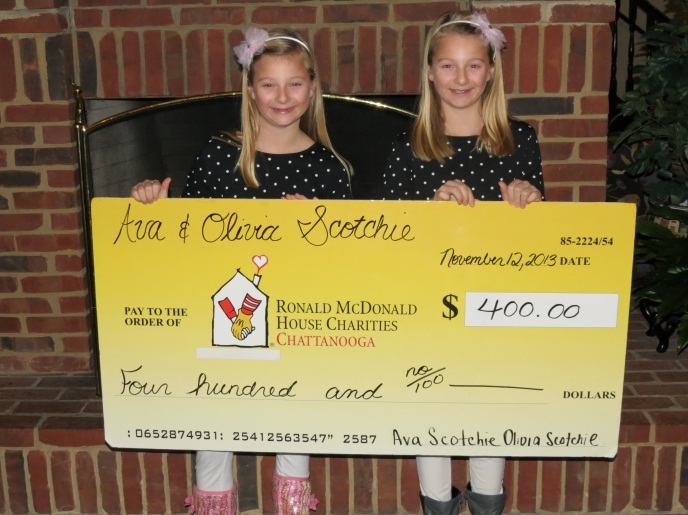 Ava and Olivia Scotchie are a double team when it comes to helping families. For the past three years, they’ve asked their friends to make donations to RMHC of Chattanooga instead of gifts. They’ve raised a total of $1,193! We hope these kids have inspired you to pay it forward as well. If you share… it becomes contagious too! Pass it on and help families at Ronald McDonald House today.